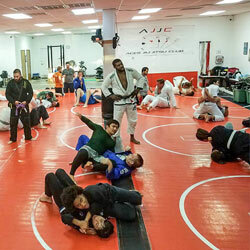 Aces Jiu Jitsu Club has something for everyone. Whatever your skill level or age is, we have multiple programs that will benefit you, and help you achieve your goals. Whether you’re looking to build discipline, strength, the ability to defend yourself, mental toughness, physical toughness, grow closer together as a family, have a skill to compete with, or many of the other benefits of Brazillian Jiu Jitsu. Click on any of the classes below to discover more about them.